The user interface for the control and monitoring of the direct probe for the Agilent 5973/5975 probe is via a window on the PC. This window is fully integrated with the Agilent ChemStation software. The PC software integrates to the direct probe electronics console via an RS232 interface to download the values entered via the PC window to control the actual temperature of the probe. The probe can be operated in the ballistic mode with ramp rates greater than 500 degrees per minute. In the programmable mode the user inputs the ramp rate, the final temperature and the duration time (hold time). Temperature program rates up to 400 degrees per minute can be used to control the temperature of the probe between 25 and 450 degrees C. Up to 25 levels of programmmable ramping steps are permited through this PC interface. A visual graphic presentation of the temperature profile indicates the ramp and hold temperatures as a function of time. 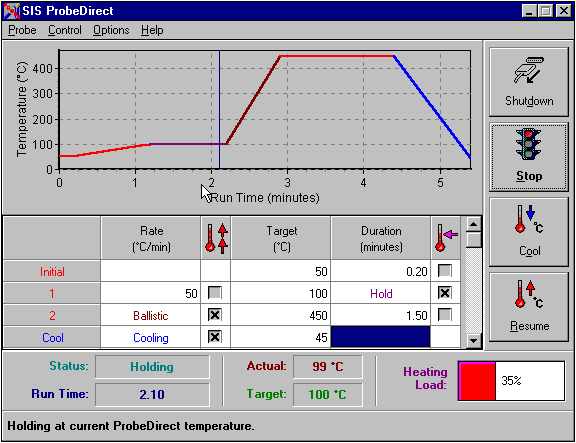 In addition the status portion of the screen shows the probe status, time of analysis, the target and actual probe temperatures and the power requirements to heat the probe (Heating Load). Controls are also present to permit the start and cool down (stop) of the probe from the PC window. These start and stop controls are also available on the front of the electronics console. In addition to heating the probe, the probe is automatically cooled at the end of the sample analysis using compressed air controlled by a solenoid valve in the direct probe electroncis console. This will cool the probe to enable the removal of the probe through the vacuum sealing system.